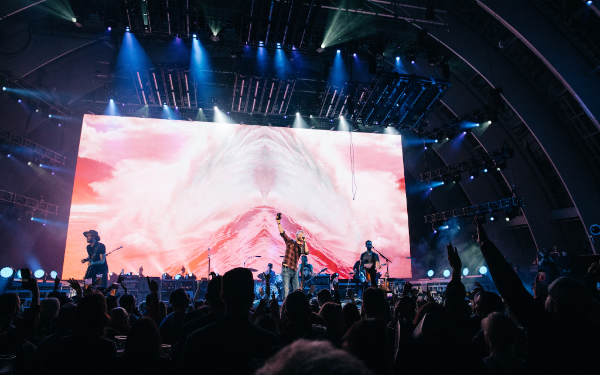 NASHVILLE, TN – Oct. 15, 2018 – Current three-time CMA nominee Dierks Bentley wrapped his 2018 MOUNTAIN HIGH TOUR this past Saturday in front of a sold-out crowd at Los Angeles’ Hollywood Bowl. Since its launch in May, “expectations were instantly met and exceeded” (Arizona Republic)throughout the 30-city run with Bentley’s “eclectic, likable tour of country styles” (Newsday). Bentley brought along special guests Brothers Osborne and LANCO, and the tour’s final show included a two-song jam with the entire lineup and surprise guest Dwight Yoakam. The full throttle tour was known to “deliver an evening of feel-good, rockin’ Country music” (Buffalo News) with spontaneous performances and eye-catching production. Standout moments included impromptu sets from Bentley’s 90’s cover band Hot Country Knights, along with a reappearance from LANCO’s lead singer Brandon Lancaster as the two paired for John Michael Montgomery’s classic hit “Sold” (The Grundy County Auction). Additionally, each night Bentley was joined by Brothers Osborne for his Top 20 and climbing single “Burning Man” where “fans danced and sang like nobody was watching” (Calgary Herald). Critics around the nation agree; Bentley has “established a foothold in the genre, particularly with touring” (Washington Post). The multi-PLATINUM singer/songwriter “has one of Country music’s most enviable brands, equal parts affability and authenticity” (Forbes). Reaching a new creative high, Bentley co-wrote 10 of his current album THE MOUNTAIN’s (Capitol Records Nashville) 13 tracks, which earned him the highest debut sales  of his career and became his seventh chart-topping album. Bentley has amassed billions of digital streams, countless nominations from the  ACMs, Billboard Music Awards and more while earning 13  GRAMMY  nominations – including at least one stemming from each of his last six albums. For more information visit www.Dierks.com.